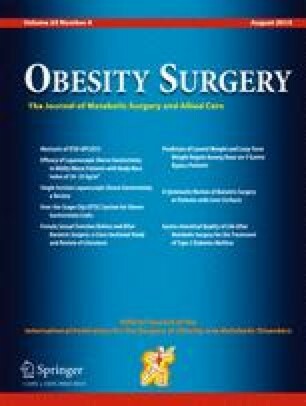 Emerging evidence has shown that bariatric/metabolic surgery ameliorates type 2 diabetes (T2DM) in mildly obese patients (BMI < 35 kg/m2) but long-term data is inadequate. We investigated the change of the quality of life after metabolic surgery in not well-controlled T2DM patients with BMI < 35 kg/m2. The quality of life was measured by the gastrointestinal quality of life index (GIQLI), a 36-item questionnaire divided into three domains of general health and one domain of specific gastro-intestinal symptoms, administered before operation, at 3, 6, and 12 months after surgery. A control group matched in age, gender, and BMI was recruited for comparison. A total of 86 patients were enrolled, and the preoperative BMI and HbA1C (mean ± SD) were 30.7 ± 2.8 kg/m2 and 9.3 ± 2.1 %, respectively. At 1 year after surgery, the BMI and HbA1C were 24.3 ± 2.3 kg/m2 and 6.2 ± 1.1 %, respectively. There was a significantly improvement in all of the measures of glucose metabolism. Complete remission (HbA1C < 6.0 %) was achieved in 56 subjects (65 %) at 12 months. The GIQLI score was significantly impaired in T2DM patients before surgery compared with the control group. The GIQLI score significantly increased from 109.2 ± 20.0 to 116.1 ± 14.2 points 1 year after surgery. The patients had improvement in the three domains of general health (social, physical, and emotional function) without a difference with the normal control but deteriorated in the domain of specific symptoms. Most of the patients experienced symptoms including abdominal pain, bloating, flatulence, belching, abdominal noise, regurgitation, dysphagia, slow eating speed, nausea, bowel urgency, and incontinence after metabolic syndrome. Health-related QOL improved dramatically after metabolic surgery for not well-controlled T2DM patients with BMI < 35 kg/m2, but patients might develop specific gastro-intestinal symptoms after surgery. All authors declare that they have no conflict of interest, and the study has not been supported by any grants. Schauer PR, Bhatt DL, Kirwan JP, et al. Bariatric surgery versus intensive medical therapy for diabetes. N Engl J Med. 2014. doi: 10.1056/NEJMoa1401329.